I haven't had a chance to post any skies over the past two months. Too much traveling in remote places, not enough time, not enough internet. This weekend is the calm between two storms. Looks like, hopefully, the next storm will come from Nepal where I hope to spend a month for work. This is one of my favorite recent shots. We were driving from Xieng Khouang back to Vientiane with a guest so I begged some time in Phatang. We walked up into the temple by the side of the Song River and I took some pictures. This picture is of Phatang itself. It literally means "the Cliff Throne." Friends from Xieng Khouang told me that there were many makeshift internally displaced people camps around this valley, which was about a day's drive from Vientiane at that time. There's a small airstrip at Vang Vieng, where supplies and food could be flown in. The picture below was taken on 17 Feb, where the sky came down at touched the Earth in Nong Haet district. It was very cold but it didn't seem to stop the kids. I think they were laughing to see the figure of a foreigner materialize out of the mist. 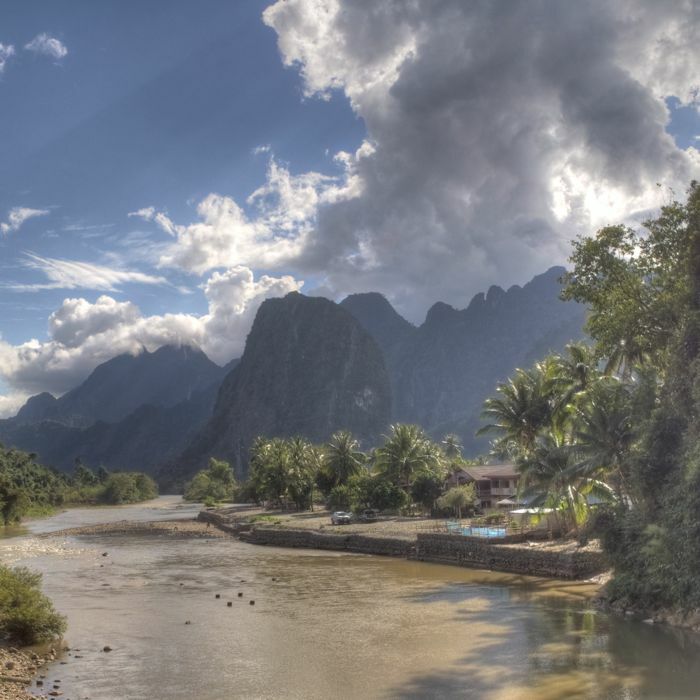 While Laos is considered a tropical country, the mountainous North can get very cold during the winter. The elevation here in Nong Haet is about 4,000 ft.
And finally, raising a house against the background of the sky. 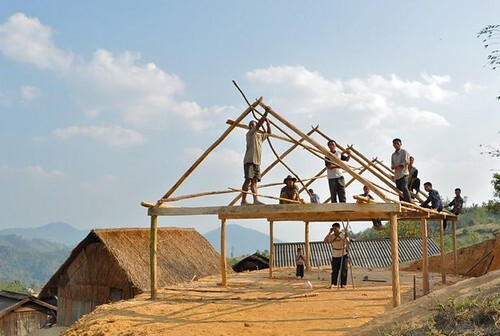 When villagers construct houses, they mobilize friends and neighbors to help them. Beautiful tropical scene! 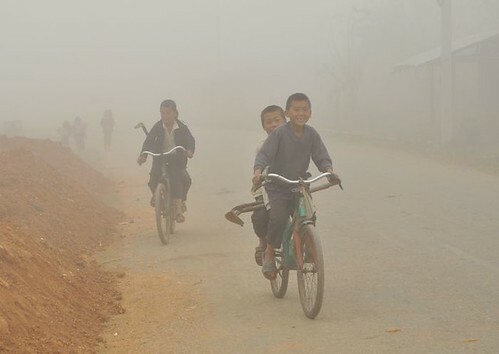 I also like the image with children and fog in it. Nice job! This is an incredible location and great photo.